Important changes within the NHS and nursing have taken place over the last fifteen years. The healthcare environment has been transformed and the picture of professional nursing redrawn and sharpened. But how do these changes relate to practising nurses and student nurses at the beginning of their professional practice and what effect will they have on the everyday lives of nurses and their patients? The future for the profession and for a high-quality, collectively provided health service is now very much in the hands of all nurses. 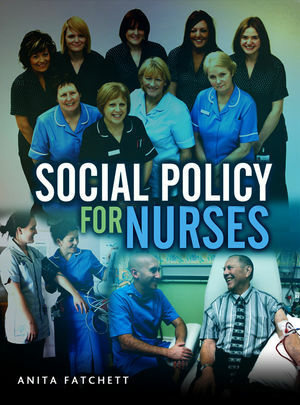 This book sets out to inspire the current and future generation of nurses to reflect fully on the influence that health policy has on their profession and daily practice, and on health service provision more generally. Anita Fatchett is senior lecturer in health at Leeds Metropolitan University. 11. Policy and Nurse Professionalism Today: A Threat or a Promise? "Anita Fatchett has gained a strong reputation for knowledge and excellence in the teaching of nurses. This clear and well-written book further justifies her reputation and should be the definitive text for today's nurses working in a transformed modern professional environment." "As nursing and the NHS go through turbulent times, this book gives us the social policy context to remind us where we have come from, and assess what the future might hold." "This book is highly contemporary and includes commentary on the latest in a series of dizzying changes to the NHS. Fatchett has the gift of summarising the key points of nearly 60 years of policy and drawing out their significance for nursing and nurses."